Fayuan Temple is one of the most famous and architecturally beautiful temples in the city of Beijing. 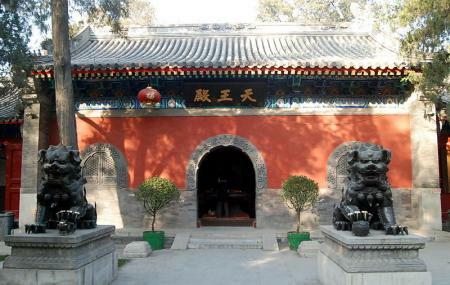 Located in the southwest quarter of central Beijing the destination sees a lot of visitors and tourists looking for the perfect way to attain calm and peace. The temple was built by the Emperor Li Shimin during the rule of Tang Dynastyin 645.The place has many Buddhist texts from the Ming and Qing dynasties. Take a bus from Noriko alley south exit. How popular is Fayuan Temple? People normally club together Niujie Mosque and The Temple Of Azure Clouds while planning their visit to Fayuan Temple. The oldest temple in Beijing. If you are interested in history, you can find many stories about the temple. There is a novel with the name of the temple by a Chinese author in Taiwan. The temple is well kept but only few visitors. Active school for monks and temple. Come to pray or meditate. I give one star hoping no more tourists come here to disturb the tranquility of the temple. Can't believe near center of Beijing city, there is such a peaceful and calming temple where young monks are studying inside. Tourists, don't come. There is nothing to see here. It's a 1 km walk (15min) from exit D of the Caishikou metro station on line 4. This is active Buddhist temple and you'll see monks strolling the grounds and worshipers burning incense. Most exhibit areas are closed, thus I think there is reduced gate fee of 5 RMB. Of all the temples I visited, this temple alone had 4 beggars at the front entrance. One beggar sat at the steps of the ticket office, and he helped me identify that it was the ticket booth as there is no sign to indicate ticket sales. There must have been no tourist activity since I tapped the window to wake the ticket agent. He seemed in a deep sleep. I ventured into the open spaces and open doorways without any map or signs to mark the way as there are no English signs within grounds to indicate the landmarks. The bell and drum towers were closed. Mainly, the buildings in the center were open. these were buildings of worship with knee pads set in the front for worshipers to bow. There are a few cats roam the area.